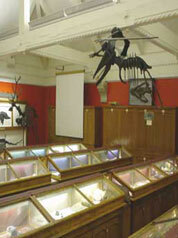 The Geological Museum is situated on the top floor of the Department of Geology. The Museum collections date from 1777, and comprise about 80,000 specimens. The main palaeontological holdings include Irish Silurian and Carboniferous invertebrates, Mesozoic ostracods, and Upper Palaeozoic miospores. The mineral collection largely dates from the 1820s and contains both Irish and foreign specimens. The exhibition The Story of the Earth contains displays covering the complete range of geological topics, and is suitable for school parties, university parties, and the general public. 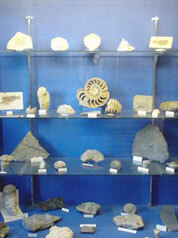 The Geological Museum is open from 10.00 am to 5.00 pm Monday to Friday. Material for academic research and for exhibition purposes is available on a short-term loan basis at the discretion of the Curator. 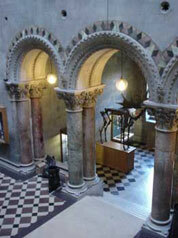 The Museum Building, which houses the Geology Department, was designed by Thomas Deane and Benjamin Woodward. It is inspired by the Byzantine architecture of Venice and was built in 1853-57. The many interior and exterior carvings were executed by the Cork-born brothers John and James O'Shea, who gathered fresh flowers to use as their models. The exterior walls feature Wicklow granite and Portland Stone. The interior walls are faced with Caen Limestone. 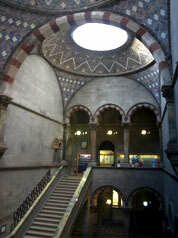 The pillars, balustrades and bannisters contain examples of Irish marbles and Cornish serpentine, while the domed roof is made of blue, red and yellow enameled bricks.